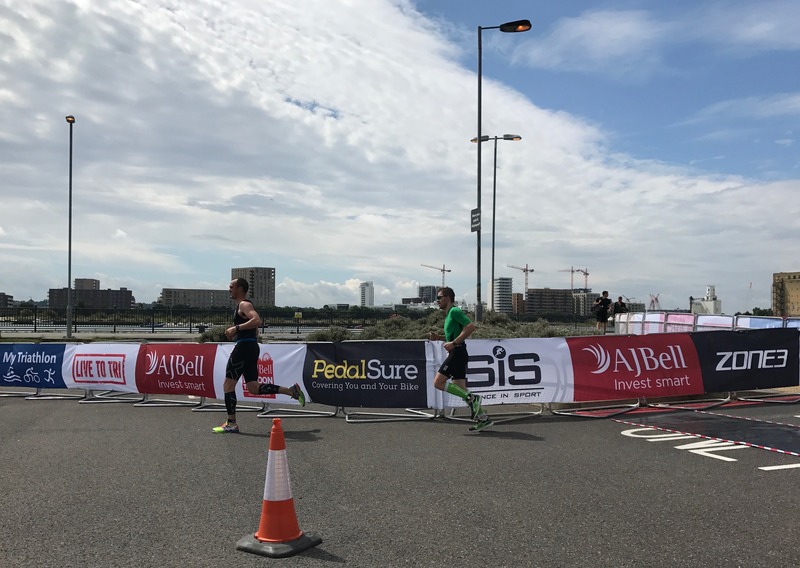 It started with a tweet from The AJ Bell Group announcing a chance to win entry in to the London Triathlon 2017. As a few of you will know, I like competitions. I seem to do quite well in competitions. I had forgotten about this one though… so receiving a reply a week later to say that I had won, was quite a surprise! I had been toying with the idea of another race between the Cotswold113 and Weymouth but nothing had leaped out as suitable or desirable. To be honest, this coming a week before RideLondon was probably why I’d dismissed it before anyway, but I’m not one to let a challenge go! At the point of registration I had to choose the event; Sprint, Olympic or Olympic Plus (the bike leg was 80k otherwise the distances were standard Olympic). To confuse matters further there were different courses for the Olympic depending on whether you wanted to compete on Saturday or Sunday. The Saturday race seemed more like the ITU style, with lots of laps of a short course. The Sunday race was called the ‘Westminster’ and had you riding out along the river and turning around at Big Ben. After much procrastination, I opted for the Sunday Westminster route as I figured I may as well see a bit of London, also my tri bike is better suited to long straight roads and not lots of turns. We were planning on travelling down on the morning of the race so I asked to be put into the latest start possible. This turned out to be the ‘Sub 2:30’ event. Having never done an Olympic distance I had no idea if this was viable. Man maths told me that I can complete more than twice the distance in less than twice the time, thus it was fine. Ultimately when we factored in traffic, registration etc we ended up staying over the night before so my procrastination was even more unnecessary! Race morning turned out to be a very straightforward affair. We had booked to stay in the Hotel Ibis as it was very close to the Excel, however we were upgraded to the Novotel as it was full. This was a full 30m closer to the Excel. Result. I had my usual breakfast and then we headed on over to registration. Despite thinking we had loads of time, we quickly ran out of it, which left me dumping our very heavy bag on my poor wife! Transition was a very organized, if a little cramped, affair. Racks were allocated by wave on a first come first served basis. I was fortunate to end up with a spot about 3 from the end of the row, hopefully making it easier to spot. Along with the green bar tape! I set up my nutrition, although this was a bit of a mystery to me, it felt like I’d got nowhere near enough with 1 bottle and 2 gels on board! After sorting my bike and transition area it was time to get into my wetsuit and then make my way to the pre race briefing area. Despite being a ‘Sub 2:30’ wave there were a number of people who raised their hands to the question of “Is this anyone’s first triathlon?”. Err… ok, confident, no!? Thankfully I managed to spot my wife just as we were heading down, minus the heavy bag which she’d managed to take to the car. It was on my way to the water that I learned that we had some pretty steep, shiny concrete stairs that we would have to ascend on the way back to transistion, not ideal! As we got dock side everything suddenly became a bit of a rush and we were hurried in to the water. I had discussed a different approach to the swim with my coach as typically I’ve struggled to go off hard. Thus the plan was to do exactly that, try and find some feet and hopefully still finish strong having saved energy. Frustratingly all that went out the window as whilst I was making my way to the front of the swim, the gun went. This left me in the midst of the most violent swim start I’ve ever experienced. I was grabbed, kicked, punched, swum over – you name it. Writing the plan off as not going to happen, I pulled into some space out to the left and stuck with it. The new plan was the usual plan; stay out of trouble and finish strong. Fortunately the swim was long enough for this to be viable and as I got on to the ‘back straight’ I pushed on hard. The taste of diesel from the water will stick with me to this day, whilst the water was reasonably clear, it was clearly not clean! The remainder of the swim was fairly uneventful, however I was frustrated when I exited the water and the time didn’t make me feel any better. Clearly the start, or rather stop/start had cost me badly. Different to the norm was that you had to remove your wetsuit before going upstairs to transition. Fortunately willing volunteers were present to assist where they could. Transition was a major concern for me as in my usual distance speed is less critical. It turned out to be quite a valid concern, taking minutes more than the fast guys. I’ve no idea how I took so long as it seemed fairly quick to me!? The route I had opted for took me to Big Ben and back, with another loop thrown in. 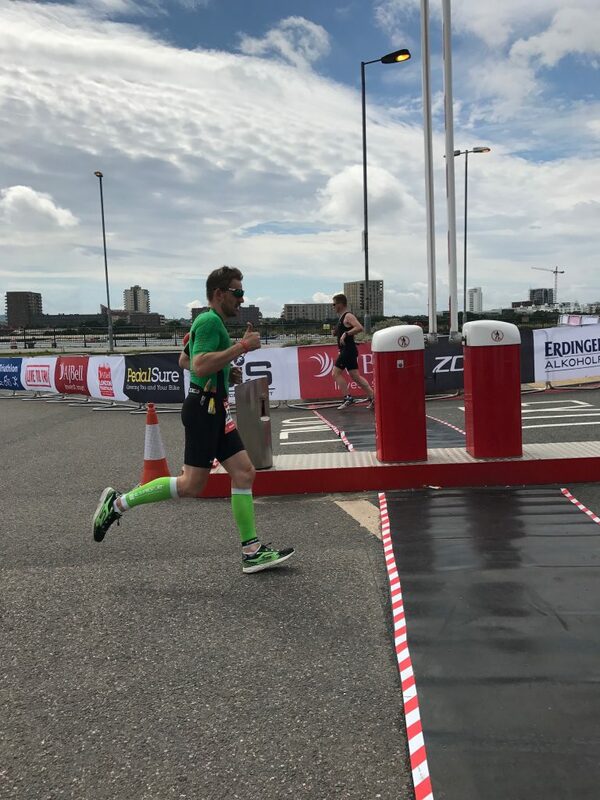 The first part of the course however involved a rather treacherous exit down some ramps from the Excel. Once I was out on the road I settled in to a decent rhythm. Pacing was going to be a tough one, so we decided that Z4 was the order of the day. The course map implied it was flat, reality was far from it. Fortunately this was the first race since having eTap fitted. I now completely understand the benefit of electronic gears, being able to change from the bull bars whilst climbing or descending was a wonderful thing. To be honest the bike leg was quite uneventful, although I did enjoy riding through the long tunnels – something my Garmin did not! I didn’t notice any of the sites, other than the familiarity from the London Marathon course. I did spend quite a lot of time cursing the lack of rides spent since my new bike fit though; my neck was a tad stiff! The turn around was a pleasant site, quite a lot of support was still out despite the late point in the day. I was only passed by 2 riders on the way. The journey back was more irritating as I was passed by a further 2 guys riding a lovely little draft. They clearly knew what they were up to as they backed apart as the motorbikes went by and also when they saw photographers. I don’t understand, why cheat?? 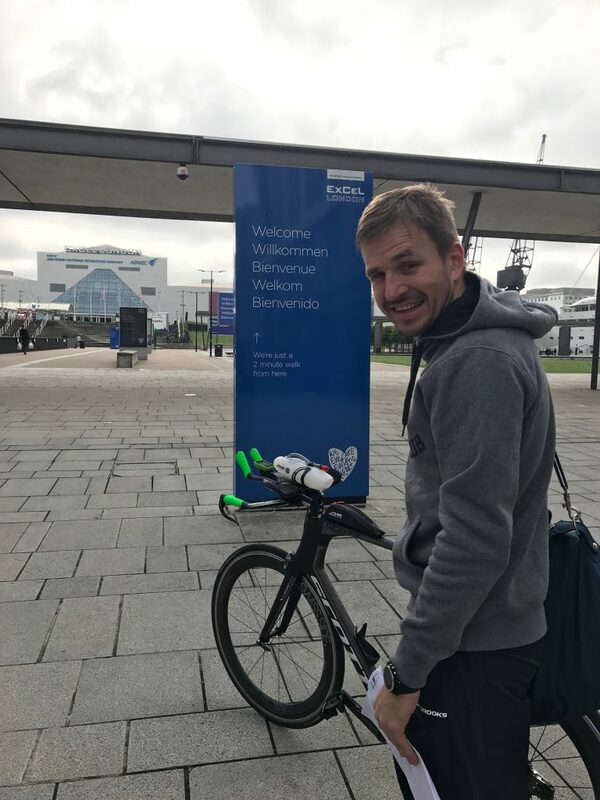 As we got back near the Excel we had to ride by and do another loop back towards Canary Wharf before heading back again. About this time a guy caught me up and we had a great little back and forth (legal!) for the final loop before I finally dropped him with about 2 miles to go. I was pleased with the ride as even though it wasn’t flat, I’d felt good. Obviously it was a new PB for 40k and I was ‘only’ 6 minutes off the fastest guy from my Age Group. Not bad for a Long Course athlete! Thankfully T2 was quicker and I was off on my way fairly promptly, but again still way slower than the best! I’m almost bored with writing this now, but the run was to be yet another managed affair. I had injured my right foot and was suffering from pain on the outside edge near my ankle. It didn’t seem too bad, so I set off with the intention of ‘running within myself’. The plan was to get round as fast as I could but with no expectation. The run course was a very uninspiring 3 laps but also thankfully quite flat, with only a small ramp up and down before doing a circuit inside the arena. 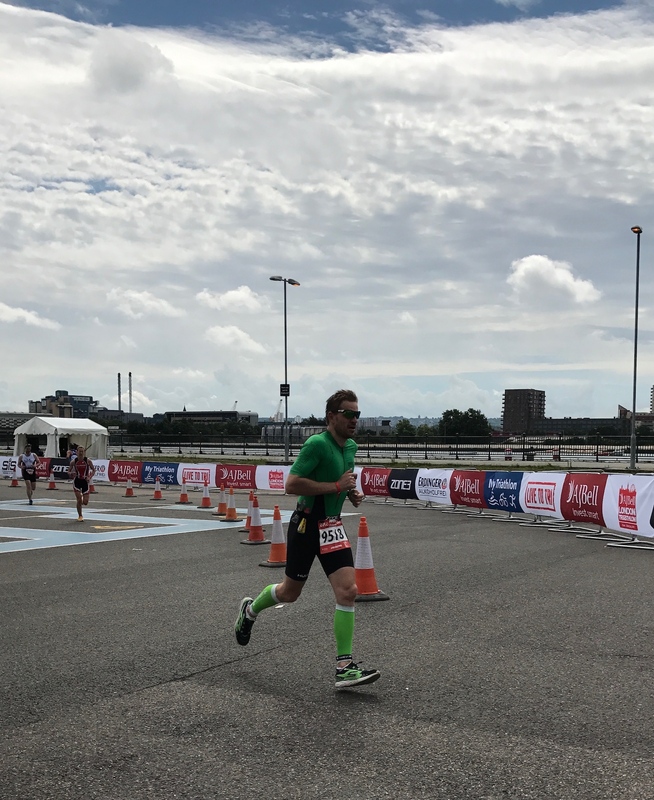 I tried to run with minimal impact on my foot, so striking gently but actually felt very smooth and light on my feet throughout. Even, dare I say it, feeling like a runner again! 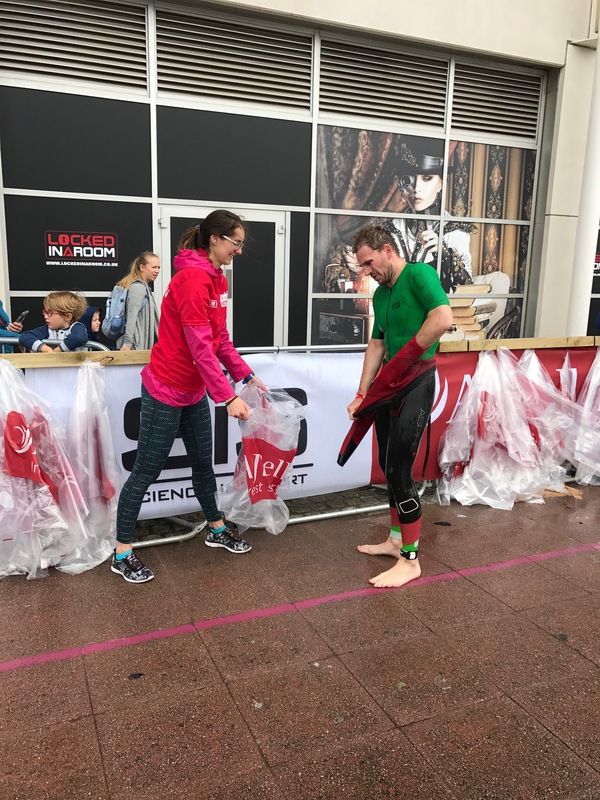 I’m not sure it’s a race I’d do again as the swim was pretty grim (I also managed to contract campylobacter within the next week which prevented me from doing RideLondon and this was the obvious candidate!) Still it was a decent event, fantastic for supporters with a decent Expo to keep folks entertained.